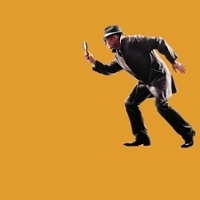 Learn what inspectors look for and how to prepare your lab. The campus fire marshal works in cooperation with the Research Assitance Program to conduct fire inspection in all campus laboratories. Inspections focus on compliance with fire and life safety regulations including Title 19 of the California Code of Regulations and the California Fire Code, as well as campus policies. Fire inspections will not include a fire drill or interfere with research/instruction. Open flames and flammable gases are prohibited in biological safety cabinets at UC San Diego. BSCs plumbed with a gas line will have their gas lines removed or shut off by Facilities Management (FM). Environment, Health & Safety will coordinate with FM and the lab's staff to facilitate removal or shut off of gas lines. New BSC installations will not be connected to gas lines. Prohibition of open flame is intended to prevent fires or explosion within BSCs. Many alternatives to continuous flame devices are available. Read the open flames and flammable gas policy for details. Compliance with California Fire Code (CFC) chemical allowances within the building. Keep inventories within fire code limits. Fire code limits differ by building, building floor, or a defined storage. In some cases, these limits are subject to building occupancy, control areas, maximum allowable quantity and other circumstances. See chemical storage and inventory guidelines (fire code limits) for a description of variables that determine chemical allowances for each building. Department safety officers (DSOs) can monitor for control area overage through the My Research Safety Web portal. View and export uniform fire code summaries and details by building. Contact your EH&S Research Assistance Program specialist to obtain more information about chemical storage allowances for your facility. Segregate incompatible chemicals to prevent accidental mixing which could cause fire, explosion, or toxic gases. Follow UC San Diego chemical storage and inventory guidelines for safely and securely managing chemical supplies and complying with fire code requirements. Implement special storage requirements for high-hazard materials. Learn more about chemical compatibility guidelines, organic peroxide formers and pyrophorics and other highly reactive materials. Note: Pyrophoric materials can only be stored and used in completely fire sprinkled buildings, per California Fire Code. 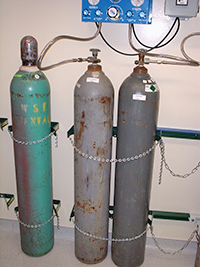 Follow requirements for compressed gases in UC San Diego facilities. UC San Diego researchers working with compressed gases must follow an approved hazard control plan (HCP) obtained through the Hazard Control Plan (HCP) application. Compressed gas safety requirements are determined by the hazard class of the gas. Check toxic and hazardous gas classification to determine the hazard class of your material. Then follow the appropriate requirements. Note: Compressed gas cylinders must be secured at all times, whether empty or full. The image above illustrates properly secured cylinders. Modifications to wall or ceiling assemblies. Keep walls and ceilings intact. Some laboratories are constructed with fire-resistant barriers, such as walls and ceilings. 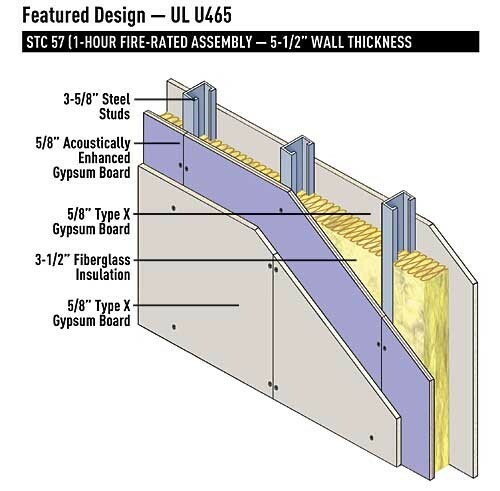 These fire-rated constructions help prevent the spread of fire for a prescribed period of time. In case of a fire, displaced ceiling tiles or drilled holes compromise adjacent rooms and floors. Avoid making modifications to wall or ceiling assemblies. Any modifications (e.g., addition of a sink, running cable or wires, etc.) to a laboratory must be reviewed and approved by Facilities Management and Fire and Life Safety. Learn what is permitted and prohibited in corridors to ensure building occupants have a clear pathway and safe exit in an emergency. UC San Diego has a strict policy for permissible and prohibited use of equipment and storage of materials in corridors and CORE spaces. Follow UC San Diego corridor safety requirements. Identify potential electrical problems and promptly resolve them. Serious fire and shock hazards can result when electrical equipment is not maintained or properly used. Follow UC San Diego electrical safety guidelines and reduce the possibility of fire or electrical shock. Keep exit doors closed, unobstructed, and operational. Learn more about fire doors and how their special construction enables them to hold back smoke/fire long enough for people to evacuate during a fire emergency and limit damage to the building. 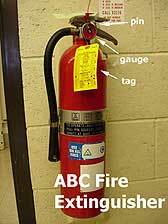 Make sure your lab's fire extinguisher is unobstructed and ready to use. Use the fire extinguisher inspection checklist to perform a monthly inspection of your lab's extinguisher(s). See fire Extinguisher types and maintenance to learn about types of fire extinguishers, maintenance requirements, and how to get training. Note: Don’t confuse ‘DRY CHEMICAL’ with ‘DRY POWDER’ (terms you see on extinguisher labels). Dry Chemical refers to agents that extinguish class A, B, and C fires, while Dry Powder refers to agents that extinguish class D fires. Follow requirements for flammable and combustible liquids in UC San Diego facilities. Because their vapors ignite and burn easily, flammable and combustible liquids have strict storage requirements. California fire codes strictly limit the total quantity of flammable and combustible liquids and container size that may be stored in a facility. Department safety officers (DSOs) can monitor for control area overage through the My Research Safety Web portal and view and export uniform fire code summaries and details by building. Also, see special refrigerators for flammable liquids storage for more information. Keep fire protections systems and equipment clear. Minimum lab attire and PPE equipment are required at all times for workers in labs: full-length pants (or equivalent) and closed toe/heel shoes. Additional PPE, where pyrophorics and other highly reactive materials are present, may be required, based on the lab hazard assessment. UC San Diego researchers working with materials included on the high hazard chemicals list must follow an approved hazard control plan (HCP) obtained through the Chemical Hazard Use Application (CHUA). The HCP will identify required PPE. See personal protective equipment for PPE requirements, supervisor and employee responsibilities, and how to select appropriate equipment for your work. See PPE support for researchers for information about UC San Diego's laboratory PPE Distribution Program. Maintain a minimum 18 inches of clearance between a sprinkler head and anything below it. An obstructed sprinkler cannot detect heat and operate, allowing fire to spread until the next available sprinkler is activated. During one campus lab incident the sprinkler closest to the fire's origin probably would have extinguished the flames. Obstructions blocking the sprinkler prevented it from activating. The fire spread, ultimately causing 3 sprinklers to activate, flooding the lab and the floors below it, all the way down to the basement. Learn more about how fire sprinklers operate. Note: Pyrophoric materials are not allowed in buildings that are not equipped with sprinklers. Questions? Contact Fire and Life Safety, (858) 534-3659.